Scientist are baffled by the occurrence of frequent earthquakes in the DFW area during the recent past. When you leave mid North Louisiana--my home for most of my life (will always be home)--you are in the rolling hills. Those same hills continue almost to the edge of Dallas with a brief re-occurrence mid Fort Worth. It becomes flat on the edge of the Dallas area--and except for the last effort at rolling mid Fort Worth-it stays flat---FOREVER! When I say F L A T, think of pancakes--no flatter---think of the finely sanded grain of the floors which have been trod upon for almost 100 years in my bungalow--no flatter still--in other words flatter than flat! NOT the terrain you associate with earthquakes! Why the only faults imaginable around here are the personality traits of some of the neighbors in The Hood! WHY THEN ARE WE HAVING EARTHQUAKES--I DIGRESS! It has come to my attention during the past month, that the house which Dr. SIL & #1 Daughter call home is directly on top of a live volcano which erupts daily--in fact SEVERAL times each day. Appropriately, I have named the hissing and spitting volcano--MOUNT MATTEL. For you see they are living upon a giant geyser which spews toys of various sizes and shapes multiple times each and every day--without exception from one end of their house to the other. The eruptions are so violent that toys spill over into the garage and eventually bleed into the yard in streams filled with plastic/metal/wood- shaped as miniature versions of life size objects from all venues of life. An eternal spring pouring a constant stream of child size objects bubbles from each and every room throughout the day--with no end to the supply ever found. Once a day---we stop---and pick up--and put back---and try to dam the flood--to no avail. 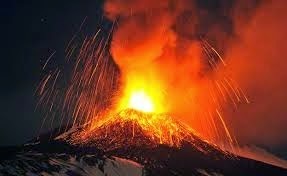 The eruptions begin the very next day---pre-dawn and continue until the last pint sized person is slumbering in their toy filled beds. Not even the dark of the night and the quiet of slumber ceases their need to be surrounded by the objects of their amusement. And yet--hope obviously springs eternal--for once again--we pick up--put up--and stow away the remains from the ash heap of today's eruption. The NRA will never have to face extinction with the likes of these boys around. Each and every room has an armament case of some type. Guns, pistols, swords, knives, tanks, soldiers, armed hummers--and on and on. The bullets come in all sizes and shapes and the supply is endless. There is no limit to the number of single shot, semi-automatic and fully automatic weapons in the chests of the dwarf soldiers living within the confines of the fort within the house. Why if all else fails, they will pull a finger out and shoot you between the eyes before you know what hit you. I am quite certain one of the boys will be an engineer- for the blocks and building conglomerate is comprised of every known material---man-made and other. There are enough of these tiny elements to create a pint size New York City. DO NOT get me started on the millions upon millions of Legos. WHAT demented inventor came up with this brilliant idea? NOT one universal set to create many versatile replicas--but instead a new box and new set of Legos for each and every item to be built. The rolling stock comes in all sizes and shapes with various uses. Road building equipment, bikes, skate boards, cars, trucks, tractors, every possible item which might have a wheel--there is a replica. NOT to be partial to wheels--there is also tracks, skis, and various other forms of movables in this collection. From the very tinest to the size a small child could ride on. Do not forget Thomas--and his friends and the thousands of train tracks nor the wooden road set with the village of wooden houses to go along. Thomas also has cranes, engine houses, bridges, trees, and depots to name only a few. Lest I forget--there is also little plastic people--to go with each and every venue. There is also a closet dedicated to stuffed and plastic animals as well as every action figure who has ever donned a costume or cape. Shelves of books, games, DVD's, flash cards, coloring books--and for heaven sake do not forget the colors, paint pens, clay, and sundry other forms of art and creativity. The DVD collection alone fills a large binder. Why would you pick it all up---why not let the volcano erupt and leave the field of debris where it landed after blowing from the chasm. You will get a clearer picture of the need if you strew 3000 tiny lego pieces over the path between you and the children's room. NOW turn off the lights and be sure it is the pitch dark of the night---you need to be sound asleep and have the wail of a two year old jerk you out of bed and take off blindly staggering to scoop up the shrill scream which threatens to wake up the rest of the mob. THEN as you step bare footed onto lego after lego--you will understand WHY the volcano debris MUST be picked up before the blessing of sleep. IF ONLY I could stem the flow--for ONE DAY--the perils of living on Mount Mattel! Brilliant ... I feel your pain...in your back, in your feet, in your shoulders. oh heck, all over your body.